Already the kings of the OJHL’s North Division, the Aurora Tigers are clawing at the Conference crown. 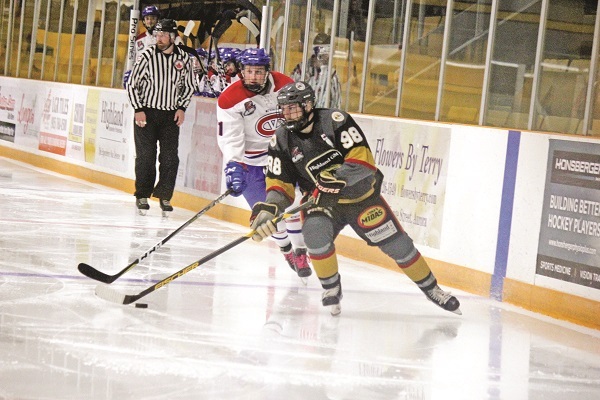 The Junior A club picked up another two points in a 4 – 2 win over the Kingston Voyageurs at the Aurora Community Centre on Friday, winning seven of their previous eight games played. With two goals apiece after two periods, Joseph Mizzi snapped the tie on the powerplay seven minutes into the third, while Jacob Ball put away a late empty netter. Tyler Davis and Jack Varga each added singles for the Tigers. Jack Irvine picked up his fifth win of the season in another stellar performance, putting up 28 stops on 30 shots faced. Mizzi’s three-point night was more than fitting, fresh off being named the NorthWest Conference Player of the Month one day prior for the month of September. Aurora team captain Steven MacLean said he sees “lots of firepower” up front from the veteran, as well as the heavy shots and nifty moves of ex-OHLers Kyler Bollers and Jacob Ball. The talented 20-year old from Markham amassed nineteen points over nine games, including three game-winners. Leading the league in points through the first five weeks of the season, Mizzi has helped Aurora stay snug atop the North Division, and only two points back of the Oakville Blades for the Conference lead. A surprise upset at the hands of the lowly Lindsay Muskies on Saturday night, however, dropped the Tigers out of the nationally-ranked top twenty CJHL list, earning honourable mentions this week. With the game tied at twos heading into the third period, none of Aurora’s 19 shots they threw on net were successful, while Lindsay added another pair for a 4 – 2 win. Christian Filippetti earned just his second loss of the year between the pipes in stopping 24 of 28 shots, snapping a three-game winning streak. The Tigers will bring their record of 9-3-2-0 into a matchup with the Newmarket Hurricanes Thursday night. Aurora has swept the Battle of Yonge Street season series through the first two games so far. They return home Friday for the start of a seven-game home stand, hosting the Markham Royals (6-5-1-2). Puck drop is set for 7:30 p.m. at the ACC.